Mood board: According to this month’s Lyst Index, Moncler is the fourth most popular brand in the world. Two seasons ago, the Italian outerwear expert announced a revolutionary retail approach, closing a plethora of its lines (from Gamme Rouge to Gamme Blue) and launching Moncler Genius – a product umbrella which sees a host of designers reinterpreting his famed padded-down jackets. We’ve seen Craig Green’s sculptural scuba suits, Simone Rocha’s Victorian hiker-inspired outerwear and Pierpaolo Picccioli’s priestly puffer jackets. New to the line-up for A/W 2019: Richard Quinn and Matthew Williams of 1017 ALYX 9SM, plus Veronica Leoni and Sergio Zambon taking the creative lead at Moncler 1952. 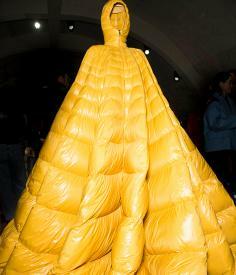 Scene setting: For its A/W 2019 Genius showcase, Moncler didn’t do things by halves. The brand set up a series of presentation galleries in the arches underneath Milano Centrale Train station. Hosts of fans turned out for the event, gathering in the nearby street, which was lined with jets of flame and pulsating music. The beauty of the Genius project lies in its designers’ ability to present differing installations inside one overarching showspace, like Simone Rocha’s tranquil beech-lined woodland or Craig Green’s industrial installation, with his sculptural pieces suspended from the ceiling, and blasted by air-like aeroplanes. Newcomer Richard Quinn drew on his horticultural heritage, creating a space pasted with colourful florals, while Palm Angels erected a paintballing venue, with colourful splashes of paint being fired at models wearing protective metallic puffer jackets.